100% Nylon. Small Appliances. SEE OUR PICS FOR COLOR. 5' 3" X 7' 6". Clothing,Shoes & Accessories. Add boobalie to your favorites to receive alerts to all our new products and sales. Sporting Goods. Hand Crafted. Finish: Beige. Size varies by hide. Product Weight : 16 lbs. 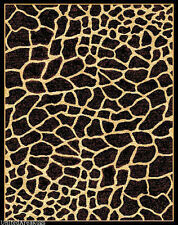 Giraffe Skin Print Area Rug 8'X10'. High density super-high pile with carved effect for enhanced appearance and texture. Machine made in Indonesia on precision looms using olefin with jute backing. Color variance, or individual monitor settings which may distort actual colors. cannot be held responsible for manufacturer's cut. Pile : 100% Polypropylene. Soil proof, Stain & Fading. Antique Old World Rug. Expertly Finely Woven For Durability, Jacquard Looms. Resolution 100% HEAT SET. Actual Size 2'7 x 7'4. Better than wool - THICK AND HEAVY. 8mm pile hieght. Color fast, soil resistant. Collection: Skyland. Like an elegant creature passing through sun-dappled forest, a lush mosaic of giraffe-brown spots glides across the ivory field. Alive with animal energy, the pattern is enriched with hand carving that beautifully displays the rich texture of this exciting area rug. Secondary Colors: Pink - Yellow - Orange - Brown - Gray. color variance, or individual monitor settings which may distort actual colors. Primary Color: Blue. Soil proof, Stain & Fading. Antique Old World Rug. Resolution 100% HEAT SET. Actual Size 2'7 x 7'4. Better than wool - THICK AND HEAVY. Highly detailed ' Work Of Art '. High Quality Woven Rug. That's why we've developed a network of multiple warehouses strategically placed across the country. Soil Proof, Stain & Fading Resistant. Extended Pile For a Soft Touch And Feel. Create an atmosphere of casual elegance with these marvelous solid and patterned shag rugs. Get a groove going in your interiors with these updated, vibrant, multi-hued, atmospheric colors. This collection is perfect for a variety of decors, from contemporary to eclectic.60% PET 20% Polypropylene 20% Acrylic. If you are looking for a rug reminiscent of animals you would see on a Safari adventure, our Wildlife Collection is perfect for you. Each rug makes you feel as though you are in the wild with beautiful animal prints and safari-inspired motifs. This Wildlife rug will make a bold statement in your home's decor.FeaturesThis rug is made of 100% PolypropyleneThe backing material is Cotton and JuteNaturally stain resistant and fade resistantKid and pet friendlyColors included in this rug are Yellow and TanProduct CareLet the rug lie flat upon arrival for best resultsReverse rolling the rug can help eliminate creasesVacuum regularly and spot clean with light detergent, removing any excess liquidTip: We recommend the use of a non-skid pad to keep the rug in place on smooth surfaces.All rug sizes. With a plush 0.5-inch pile height, this soft wool rug is a welcoming touch of cushion to your tired feet. A dense, thick pile of New Zealand wool highlights this handmade rug. Using fresh designs and the most up to date colors this rug is a welcomed addition to any room and will be enjoyed for many years. This floor rug has a beige background and displays stunning panel colors of brown and beige. Durable cotton canvas backingPrimary materials: WoolPile height: 0.5 inch Style: ContemporaryPrimary color: BeigePattern: AnimalTip: We recommend the use of a non-skid pad to keep the rug in place on smooth surfaces.All rug sizes are approximate. Due to the difference of monitor colors, some rug colors may vary slightly. We try to represent all rug colors accurately. Please refer to the text. Item Size: 26"x19"x5". Construction: Hand Crafted Chromium Finished. Material: 100% Brazilian Cow Hide. Shape: Full Skin. This hand-tufted, animal-print Hot Pink 5' round area rug features a wool-like look in shades of pink and red. This soil- and stain-resistant rug is great for any room in the house. Wool-like hand and lookSoil and stain resistantMinimal sheddingPrimary materials: 100% polypropylenePile height: 0.5 inchesStyle: ContemporaryPrimary color: PinkSecondary color: Light pinkPattern: AnimalTip: We recommend the use of a non-skid pad to keep the rug in place on smooth surfaces.All rug sizes are approximate. Due to the difference of monitor colors, some rug colors may vary slightly. Overstock.com tries to represent all rug colors accurately. Please refer to the text above for a description of the colors shown in the photo. Finish your living decor with the addition of this remarkable wool and cotton canvas rug. The natural beauty of the flowing spots of a giraffe are recreated in a tight pattern that has been beautifully woven into the Giraffe by Andrew Charles. A light grey background and neutral color palette, makes this rug a great choice for any high traffic room without sacrificing style for performance. Sleek and modern with a richly textured feel and a substantial look this opulent hand-carved rug has a plush cut and loop pile which essentially highlights the symmetrical pattern giving the rug a natural, luxurious sheen that is soothing to the senses. Its cotton canvas backing and latex application will give this rug a durability and resilience that will last for years to come. Durable cotton canvas. Safavieh Handmade Giraffe Beige New Zealand Wool Rug - 7'6" x 9'6"
This Zebra Ivory rug is simply the perfect accent for your living space. Be loud with abstract styles or choose a classically inspired theme to put the finishing touches on your roomPrimary Material: polypropylenePile Height: .4 inchesStyle: ContemporaryPrimary color: IvorySecondary colors: BlackPattern: AnimalTip: We recommend the use of a non-skid pad to keep the rug in place on smooth surfaces.All rug sizes are approximate. Due to the difference of monitor colors, some rug colors may vary slightly. We try to represent all rug colors accurately. Please refer to the text above for a description of the colors shown in the photo. The material is 7high-qualified acrylic fibres, which make the rug washable for hand or machine. Other countries or remote areas may take longer! Surface:Polyester Fibre. -Easy clean, just spray with water or sweep. It is easy to washed by hand.hand wash or dry clean only, no machine wash. Fake Beard. Easy clean, just spray with water or sweep. Easy clean, just spray with water or sweep. It is easy to washed by hand.hand wash or dry clean only, no machine wash. Fake Beard. Stay dry carpet surface can effectively increase the service life of rug/carpet/floor mats.